Genval — was very pretty. A walk after a very massive breakfast at the Chateau du Lac. And gates to who lives there? And why haven’t they cleared the Autumn leaves? Have they forgotten or been forgotten. Grilled skies and cold weather in Dusseldorf. Drive from Dusseldorf to Radhadesh. There is something very magical about Radhadesh. I clicked a series of pictures called – Gates. Christmas tree in Dusseldorf – Altstadt. To all things bare and all things lush. Saturn Mall in Dusseldorf. Apoorva got a haircut and I bought a hair dryer. Graffiti in Genval – introspective: retrospective. A pink sunset over the river Rhine. 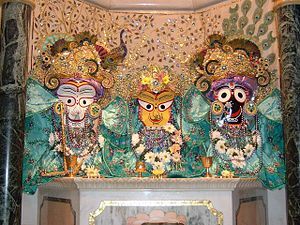 Radhadesh – an ISKCON temple in Belgium’s Ardennes. We drove from Amsterdam to Dusseldorf. From Dusseldorf to Radhadesh. And then to Genval. From there back home. It was an impromptu trip. I felt my creativity was clogged. I could smell the rust inside my head. And, I knew that all our friends would be away. We packed light, threw caution to the wind (not really – we do have winter tires but that term so aptly sums up the headspace) and galloped away. I wrote more than I typed. I read more than I watched. The hills, a tiny town, a hidden lake, waiting, learning, talking, grinding the tip of the shoe into grey gravel, feeling cold till the bones and then hot in the head – eating and sleeping and waking up to eating. It was a sweet holiday. I got to know Bambi a lot better. His big eyes see bigger dreams, irrational ones, I stop myself from rationalising. There is plenty of time for that. I watch how he meticulously plans his day and I see me. I hear him hum and I notice Apoorva. Then I see him for who he is … the bit not like me, not like Apoorva, just him … like him. I would advise going away to come back. To text friends from random locations. To tell them that however far we run they remain so deliciously close. I recognise my own need for isolation, for solitude, silence to hear my thoughts talking to each other, giving each other a good fight as my friend Natasha would say. Oh they fight and then they move on, just like you said Natasha. In ways that I still don’t understand I am finding myself.